John Frieda is known for its top of the line beauty and hair products. Its line of 3Day Straight Flat Iron Spray is no exception. This proprietary blend of polymers with keratin protein wraps each strand, seals in straight styles for up to 3 days. Not to mention it keeps hair glossy, smooth, and swinging with body. 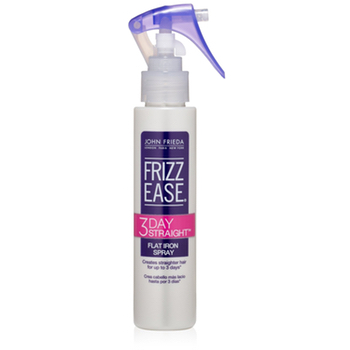 Transform your curly, frizzy hair into a straight, smooth style that lasts up to 3 days with this John Frieda Frizz Ease Spray. This revolutionary heat-activated formula wraps each strand to seal in longer-lasting straightness without weighing hair down. Spray throughout damp or wet, not dry hair. Start with 10-15 sprays. Use more or less depending on hair length and thickness. Comb to distribute evenly and blow-dry hair straight. Finish by flat ironing hair in sections. Water, Alcohol, Polysilicone-9, Hydrolyzed Keratin, Benzophenone-4, Steartrimonium Chloride, Dipropylene Glycol, Benzyl Alcohol, Malic Acid, Lactic Acid, Sodium Hydroxide, Fragrance, Disodium EDTA, Methylparaben, Propylparaben. It does a great job in smoothing out hair as you straighten it. See your hair manageable and looking great, instead of frizzy and all over the place.This spray is lightweight, and doesn't weight hair down at all which is hard to find in a hair product spray. Achieve flawless straight hair without looking greasy and stringy. The heat protection is another fantastic feature of this line. You no longer need to worry that your hair will become damaged as you straighten it.